Is France’s supermarket waste law heading for Europe? Plans to introduce a French law that bans supermarkets from destroying unsold food and obliges them to give it to charity is irritating retailers who say they already make a big effort to fight waste. Under the law, stores of more than 400 sq m would have until July 2016 to sign contracts with charities or food banks, and to start giving them unsold produce. It follows a media campaign run by a young centre-right politician, Arash Derambarsh, who says he was outraged by the sight of homeless people last winter scrambling in supermarket bins. A local councillor in the Paris suburb of Courbevoie, Derambarsh began his campaign by collecting the unsold food and handing it out to the needy. He then launched an online petition, which helped create momentum for the new law. While broadly welcoming the idea, charities are also wary about ending up with more food than they can handle. "This had better not translate into a poisoned chalice," says Olivier Berthe, president of the Restos du Coeur (Restaurants of the Heart) charity. "We cannot be made to accept donations we do not need. We cannot become rubbish dumps." 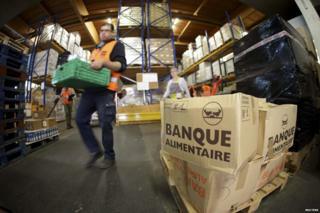 Jacques Bailet, president of the French Federation of Food Banks (FFBA), also says there is a risk charities will not be able to cope. "Our food banks are going to need more staff, more lorries, more refrigerated rooms. But to get all that, we will need money - and money is pretty scarce these days," he says. The FFBA already collects 35% of its donations from supermarkets, and Bailet praises retailers for their co-operation. The supermarkets themselves, meanwhile, feel aggrieved at being portrayed as food wasters. "It is wrong to point the finger at the big supermarkets when we represent just 5% of food waste in France. In fact we are exemplary - with 4,500 stores having already signed contracts with associations," says Jacques Creyssel of the Federation for Commerce and Retail. At the Leclerc hypermarket in Templeuve near Lille, manager Thomas Pocher says that for every seven customers who come through the shop, he already gives one meal to charity. The store creates 250 tonnes of food waste every year, and has contracts with local charities. Tax credits - which allow the shop to offset some of the lost value of the goods - are an encouragement. Pocher feels the new law would be a "nonsense cooked up by politicians so they can feel better about themselves", and that supermarkets should be allowed to solve the problem of leftover food in their own way. "Here in Templeuve we have signed a contract with local farmers to make a range of soups out of wonky veg. This is stuff which was never sold before, and now we have a top chef designing a soup and people love it," he says. "If you make supermarkets donate, it will create all sorts of problems. First, there is a lot of produce which I would refuse to give because it is not consumable. Second, what happens in smaller supermarkets where they do not have the backroom staff to handle the paperwork? "The food waste issue is very important, but it should not be left in the hands of Greens and ecologists and people who want to change society. As businesspeople, we can do a lot by ourselves." Derambarsh has other critics too. Some Socialist members of parliament are annoyed with him for grabbing the media limelight, when they have worked on the issue for years. Others point out that of the 7.1m tonnes of food wasted in France each year, according to the Ministry of Ecology, 67% is wasted by consumers themselves, and another 15% by restaurants, while shops and distributors waste 11% of the total. Derambarsh, the son of Iranian exiles who was born in Paris in 1979 and spent four years in Iran as a young child, shrugs off criticism that his ideas are simplistic. "When I was a boy I decided that when I grew up I would do something to make society better," he says. He has had a temporary setback though - France's Constitutional Council, which checks whether new legislation is constitutional and if the correct procedures have been followed, has rejected the law on a technicality. It must now be redrafted which could take some time. Despite this, Derambarsh has set his sights on Europe. Following the success of the French petition, he has a new online petition circulating throughout the European Union. The hope is to get one million signatures from at least seven countries, which would be sufficient to launch what is known as a European Citizens' Initiative - an official appeal to the European Commission to start legislation across the EU to ban supermarket waste. At present the petition has just over 630,000 supporters. If it reaches the million mark, the Commission must consider the initiative - though it can decide to take no action. Public canteens were set up to feed people in Britain during World War One - and they proved hugely popular. Could today's food banks learn from them, asks Adam Forrest.